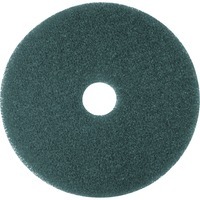 Use 20 diameter scrubbing pads before replacing worn finish to provide a fresh new surface to maintain. Use on rotary or automatic equipment with low speeds from 175 to 600 RPM and with detergent to scrub hard surface floors. Scrubbing pads are designed for heavy duty scrubbing before re coating. Also use for heavy duty spray cleaning or foam scrubbing. Blue Cleaner Pads 5300 remove dirt, spills and scuffs, leaving a clean surface ready for recoating. Floor maintenance scrubbing pad is made of nylon and polyester fibers in an open textured nonwoven construction. Abrasive particles are dispersed throughout and bonded to the nonwoven construction with a durable adhesive.